Boating is a family activity! Boats (and our slips!) are very affordable. Click on any picture to see more! 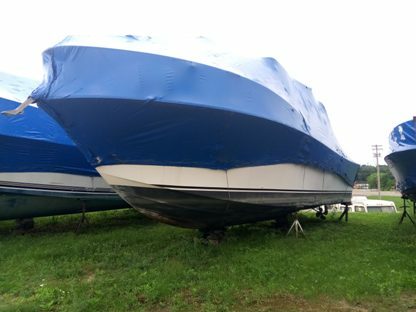 You can trailer this Chris-Craft wherever you like, is ready to go without any work needed, and is priced to move quickly. The 1995 Load Rite trailer is strong and very clean, with two axles and surge brakes. The boat has just 375 hours on it. It has a 5.7 GM engine with 50 hours on it, and a Volvo Duo-prop outdrive with about 100 hours. The Cabin has a full galley with alcohol stove, ice box, and sink. With the aft cabin, convertible dinette, and fore berth/seating area, the boat will sleep 6 people. With the full cabin enclosure, and you'll camp on the water in style. 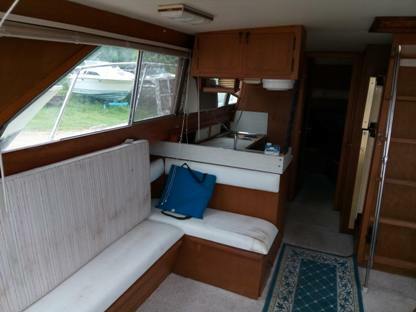 This boat has heat/AC unit, fridge, cooktop, microwave, sound system, lots of canvas, and good upholstery. With fore and aft berths, plus a convertible dinette, it sleeps 6 in the cabin. It's a pretty boat, and well laid out for entertaining. The salon seat swings around 180 degrees, making a large seating area. It has a new bottom paint job of Sea Hawk Talon antifoul paint. The twin 454s have less than 600 hours and stainless props, so it will go 48 M.P.H. Leave your friends in your wake! This is a cute little open-bow at an unbeatable price. The ShoreLand'r trailer alone is worth the full price. The interior has some tears but is complete except the glove compartment door is missing. The 50 H.P. 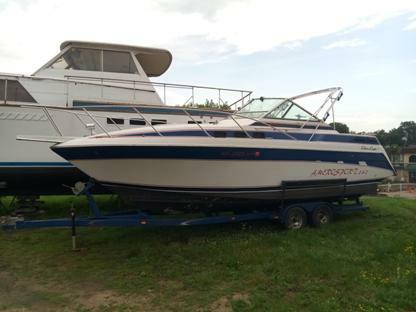 Force outboard turns and has been winterized, but has not been run. 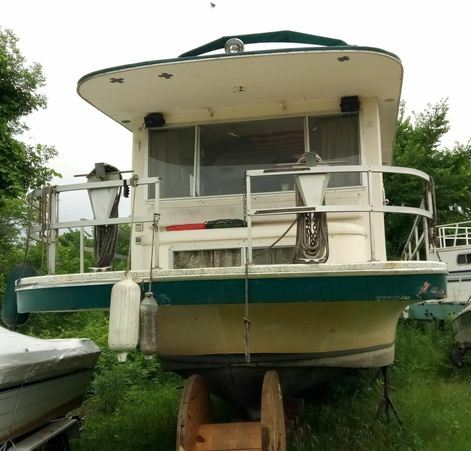 This 1977 Gibson houseboat is ready to go. With twin beds in the undercabin, a queen bed in the bedroom, and a convertible seat in the salon, it sleeps 6. A robust heater has been added for winter living, and roof A/C units are fore and aft. Davits are installed to carry a dinghy. The spacious upper decks beg you to entertain guests. There is a canvas over the upper helm deck. A full galley boasts a stove, microwave and toaster oven. The bath has a Vacuflush toilet and a large shower. 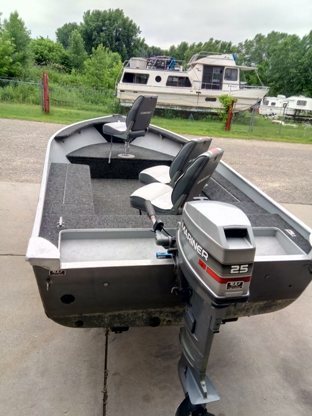 Dual drives in a trailerable boat that's great for cruising or fishing! Twin 135 HP Mercruisers move this boat along smartly, and it handles easily. 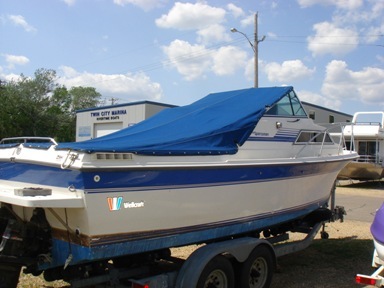 This is a one-owner boat, and is very clean and largely unused. The gimbals and bellows are new. The upholstery is nice, and the boat includes a canvas enclosure and a mooring cover. 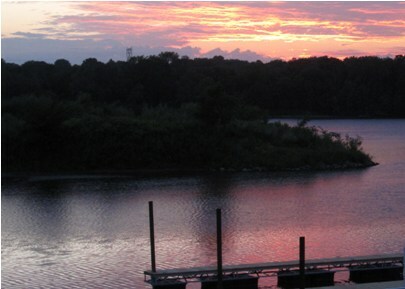 The boat has both shore power and an inverter. The cabin contains a galley, a head with new toilet, fore berth and a single aft berth.The cabin contains a galley, head, a forward berth/sitting area, and a single aft berth. Dual helm on flybridge. Flybridge cansas and window canvas. 6.5KW generator. Dual 270 HP inboard Crusaders. Large galley with electric/alcohol stove, separated v-berth. Sleeps 6 with convertible couch and dinette. Hand shower in head. 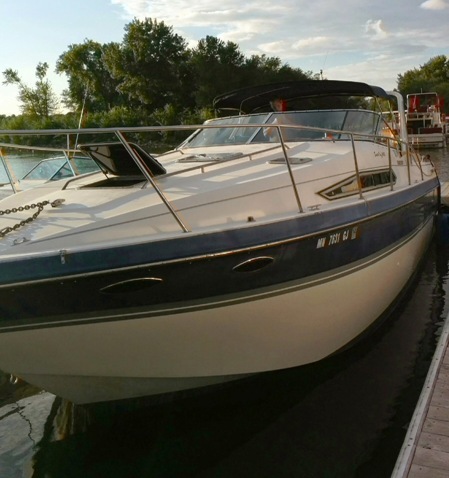 This 1977 Carver Mariner is complete, and in almost stock condition. One of the salon seats has been recovered, and the rest in the interior and flybridge are in good shape. There is some cosmetic wood damage from leaking windows. The boat is on a 3-axle trailer. Some of the original white canvas is OK. New custom-made stainless steel runners for the windows and a newer set of green canvas are both available. This boat has been used just a handful of times since it was new. There is absolutely nothing wrong with it. All the manuals are still with it. 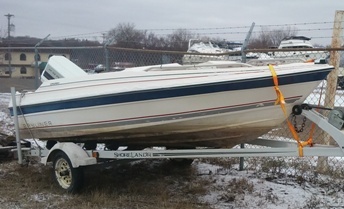 Comes with matching 1994 Shore'landr trailer. The 1993 Mariner 25ELH electric start fires up every time and pulls strongly, but the lower unit has a small seal leak. So it's now $1000 lower in price. 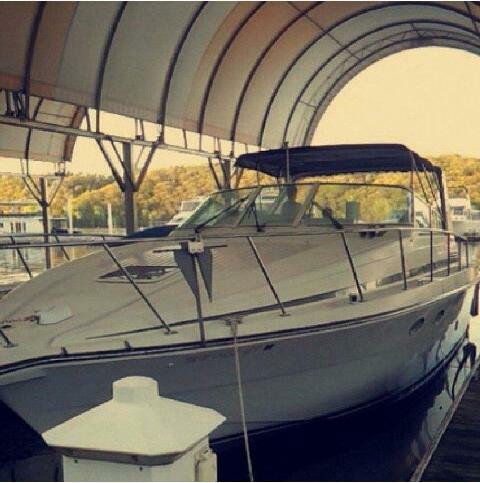 This 1994 Trojan 370 is all you'll want. Lovingly cared for, complete and running great.